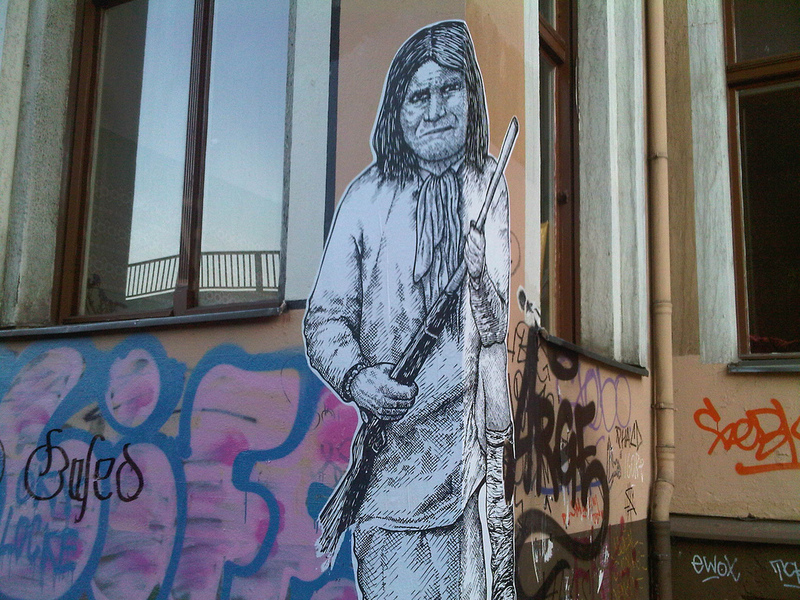 In the public mind, Geronimo is the best-known Indian of all time. Why? He was not a chief. He was not a leader in the same league with Mangas Coloradas, Cochise, or Victorio. He led only a small personal following of about 30 people, most of them part of his extended family. One reason may be that he was the last of the great tribal leaders to surrender. But there is more to it than that. How else to explain the continuing resonance of his name? As recently as 2011, in the operation that ended the life of the world’s leading terrorist, Geronimo was the code name for Osama bin Laden. Another explanation lies in the narrative of Geronimo that has come down to us today: that he was a valiant Apache chief fighting for the preservation of his homeland against invading whites. That is a myth. His homeland was southwestern New Mexico, but he spent most of his adult life in Mexico. The real story goes like this. Under the tutelage of Mangas Coloradas, Geronimo grew into a courageous, skilled fighting man who terrorized Arizona and New Mexico, Sonora and Chihuahua, with destructive and murderous raids that took many lives and huge stores of plunder. Other Chiricahua Apache fighting men did the same. But thanks largely to the newspapers, Geronimo’s name came to define the Apache menace of the 1870s and 1880s. A large element of the explanation for Geronimo’s persistent fame lies in his on-again, off-again connection to an Indian reservation: Arizona’s White Mountain Apache Reservation, also called the San Carlos Reservation. Three times Geronimo settled on the reservation, and three times he broke free and, with few or many followers, left a path of murderous destruction as he fled south into Mexico, where he intimately knew all the hiding places in the towering Sierra Madre. Army units tried to head him off on these murderous escapes but failed to stop him. The turmoil created by these breakouts provided journalists with plenty of sensational material for their columns, and his name rapidly spread to newspapers throughout the nation. After the final breakout in the spring of 1885, a two-year effort (sometimes called a war but hardly deserving of the label) sought to run Geronimo and his followers down. It occurred almost entirely in Mexico, with U.S. Army units accomplishing little more than bogging themselves down in the rugged, humid, rainy country that Geronimo knew so well. Unable to capture or kill Geronimo, the military turned to Apache scouts, who would have more success—through conversation, not fighting. In September 1886, two of those Apache scouts, led by Lieutenant Charles Gatewood, persuaded an exhausted Geronimo that the time had come to surrender. The scouts and the Army, in their pursuit, had worn down the Apaches. After the surrender, Geronimo and his followers spent the next 23 years as prisoners of war, first in Florida, then in Alabama, and finally at Fort Sill, Oklahoma. There, Geronimo died in 1909 at the age of 86. Explaining Geronimo as a person is difficult. One large reason is the scarcity of sources. He was 54 before he came to the white public’s attention. Before that, only his flawed autobiography and one other Apache source tell much about him. After that, an abundance of sources, both white and Apache, tell who he was. But those accounts are so varied that what stands out are his contradictions. In the last years of his life Geronimo—an adherent of the supreme Apache deity, Usen, or Life-Giver—attended the sermons of Dutch Reformed missionaries, announced that he had adopted the “Jesus Road,” and allowed himself to be baptized. Geronimo was a medicine man who dispensed herbal remedies, made generous use of sacred pollen, and performed healing rituals in full view of onlookers, yet when stricken with a mild form of syphilis, he turned to an American army doctor for treatment. While revered by so many, Geronimo was suspicious of nearly all people, including his fellow Apaches; he had a taste for gossip and a willingness to believe any rumor or gossip that might impact his life. And he would lie to anyone if it suited his purposes. Strikingly, it was the 23 years Geronimo and his followers spent as prisoners of war that cemented his status as icon, both for Indians and whites. The Apaches believed universally that Geronimo possessed extraordinary power. Some tribesmen vowed that they had seen him change the weather to his advantage. Others told of his ability to sense events far away. Among whites, he became a celebrity. He adapted to conditions in Florida, Alabama, and Fort Sill, Oklahoma. He was allowed to travel to world expositions, fairs, and other public venues. He sold his craftwork and put himself on display to people curious to see the great Apache butcher. He even rode with four chiefs of other tribes in Theodore Roosevelt’s inaugural parade in 1905. Our last photograph of him depicts him in a top hat behind the steering wheel of an early-model touring car. Geronimo enjoyed the acclaim, but above all he wanted to go back to Arizona and New Mexico. But this the white people, and therefore Congress, would not allow. Robert M. Utley, a historian, is the award-winning author of 17 books on western American history, including Geronimo. During his career with the National Park Service he served as chief historian and assistant director.